To arrange a visit please call first. Bonita Creek Nursery is located in a peaceful riparian valley. The ten-acre ranch is bordered by the Sweetwater Regional Park, to the North, and an Open-space Preserve, to the South. Our location is blessed with a natural spring and with being situated at the confluence of two creeks. The surrounding hills and unique topography combine to create varied micro-climates, best described as Sunset Zones 20-23. This wide range of climatic conditions allows us to cultivate an equally wide range of nursery stock. In 1995, the initial acquisition of land was made in Bonita to relocate our endangered bird-breeding program. Biodiversity and conservation were the primary motives, of this non-profit venture. 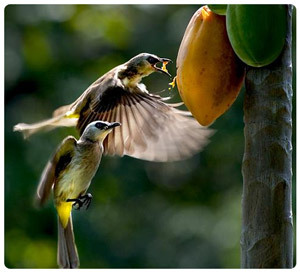 Sub-tropical fruit trees have always played a role as a source for supplementing the diet of the soft-billed birds. As the bird project grew, so did our interest in creating a year-round supply of fruit with the most varied nutritional value possible. It was at this juncture that we realized the importance of our activities in agriculture and how it related to our goals in aviculture. The collection at Bonita Creek Nursery now contains over 500 varieties of plants, producing fruits, nuts, berries and vegetables. In an effort to enrich the diversity, we actively seek new varieties from a wide range of sources. These sources could include a neighbor who has an promising volunteer seedling, a nursery wholesaler promoting new cultivars, or an importation from a foreign country with permits. In addition, we are very actively involved in the development of hybrids and new varieties. It is understood that this process of development and selection requires considerable patience. In the past 10 years we have introduced many exceptional examples of cherimoya, feijoa, guava, loquat, mango and Surinam cherry, developed here at Bonita Creek Nursery. We look to the future, with great enthusiasm and anticipation of the harvests of our " Fruits of Labor and Love ". BONITA CREEK NURSERY - San Diego, CA. We are grower of bareroot fruit trees and we are located in Southern California. We specialize in growing and grafting fruit trees like Atemoya, Cherimoya, Avocado, Banana, Carob, Tropical Cherry, Citrus, Dragon Fruit (Pitaya), Guava, Guamuchil, Ice Cream Bean, Jackfruit, Kei Apple, Loquat, Longan, Lychee and several varieties of Mango (asian, indian and hybrids). But we grow also: Fruiting Palms, Papaya, Pinapple, the amazing White Sapote, Seagrape, Starfruit, Sugarcane and tamarind. We nurse also deciduous fruit trees like multigrafted Apple trees and several varieties of Apricot, Aprium, Cherry (Sour, Sweet etc. ), Crab Apples, Fig, Hawtorne & Tejocote, Jujube, the marvelous Mulberry, Nectarine, Peach, Peacotum, asian and european Pear, Persimmon, japanese and european Plum, Pluot, Pomegranate and Quince. Our inventory include also many varieties of Berries and Vines but also Nuts trees, Australian Natives like the beautiful Melaleuca and several cultivars of Olive trees and Culinary plants. We also provide draught tollerant plants and trees, especially for Landscapers and Landscape Architects. Ask us about our desertscape design projects and water conservation tips. Remember! We also grow a whole host of dwarf and semi-dwarf fruit trees. We are able to Deliver troughtout SoCal including: Los Angels, Riverside, Orange County, San Bernardino Imperial County and SAN DIEGO COUNTY.